As I mentioned before, my SO and I took a day trip to Grand Rapids, MI, to partake of ArtPrize. It was unbearably hot, so we limited ourselves to two venues (out of 182! 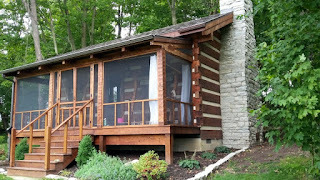 ), the Frederik Meijer Gardens and Sculture Park and the Grand Rapids Art Museum (GRAM). I posted about the former here. In this post, we'll take a look at some of what there was to see at the GRAM. 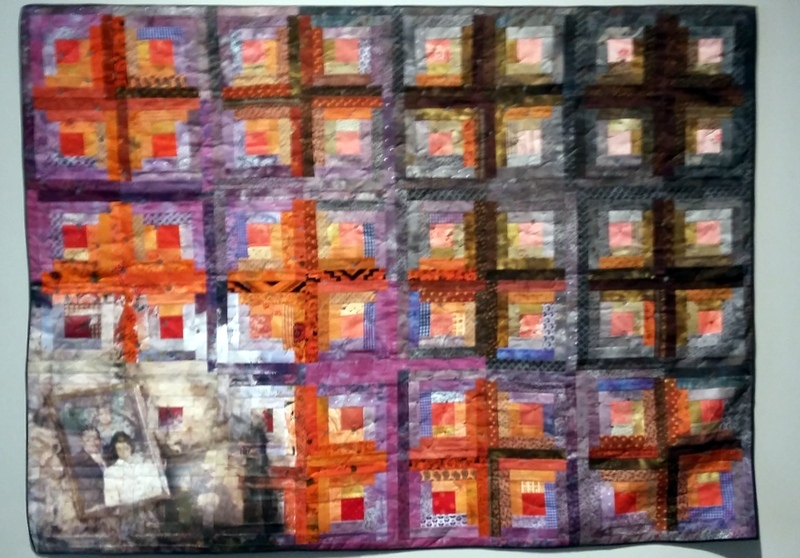 My first thought upon entering the exhibit was, "Thank God there is some textile art!" 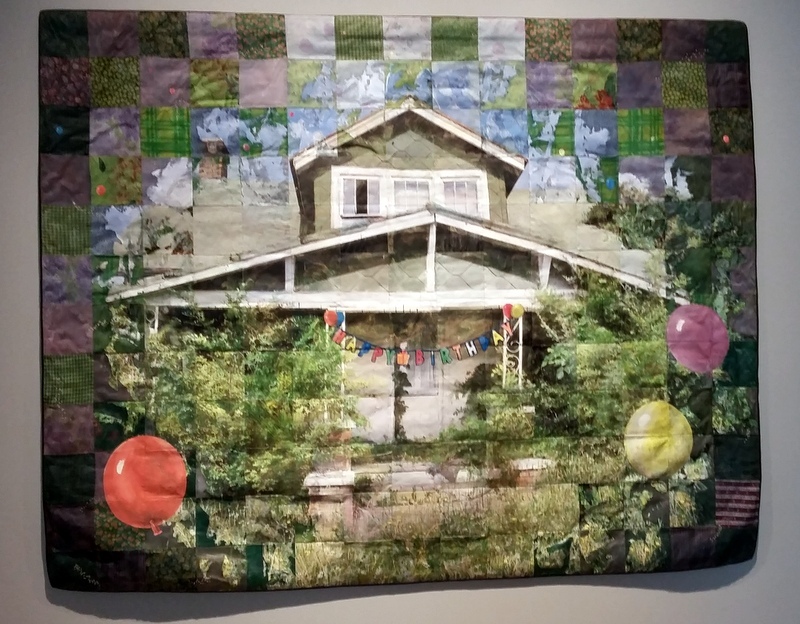 The first two below are by Jeana Eve Klein and reflect her obsession with abandoned houses. 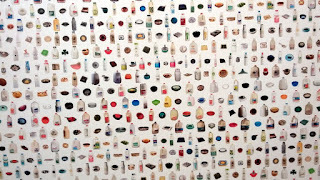 The materials are acrylic paint and inkjet printing on recycled fabric. 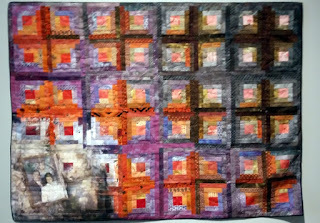 It's easy to stop thinking once one has fabric in hand, but there is so much more one can do to express one's creativity. All it takes is some imagination (and talent and skill). Letitia Huckaby used flour sacks as the base for her creations. Just one generation removed from the artist, her family grew, raised, and made everything they needed except flour. The flour sacks became dresses for the girls. 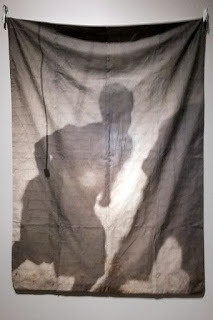 Here she superimposes images on the fabric to express the creativity and inner strength of those forebears. 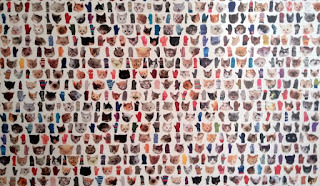 Another artist who sparked my imagination is Amy Helminiak. 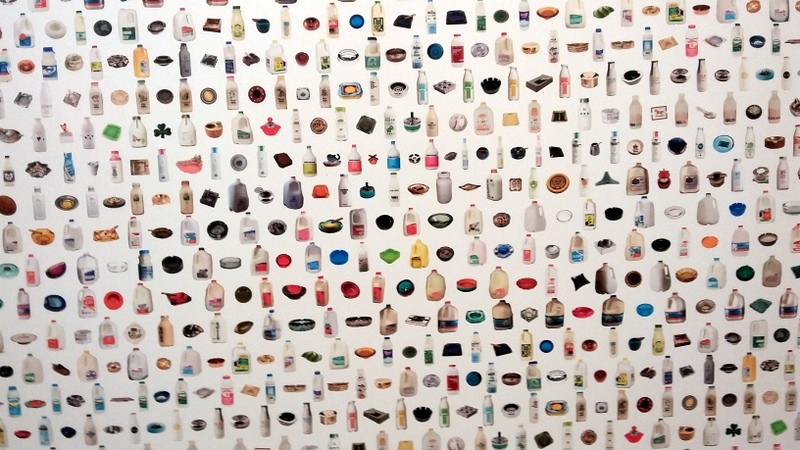 Her "digital landscapes" would make wonderful material for sewing. I'm not a seamstress, but I can imagine imitating her technique to create unique cloth. 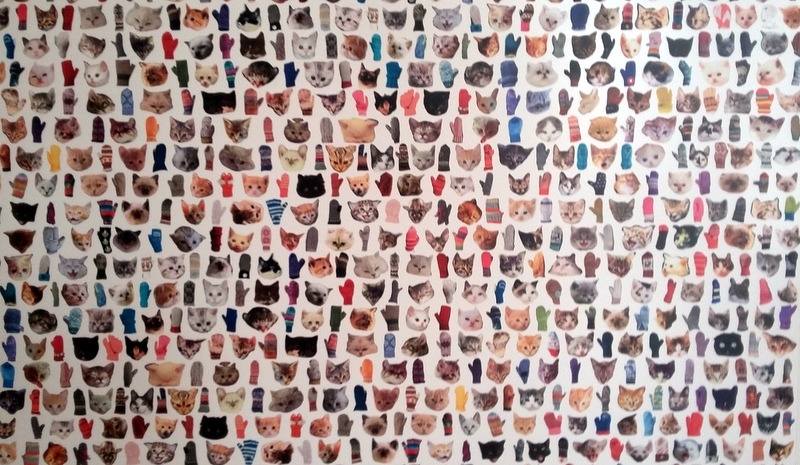 Kittens and mittens above, milk bottles and miscellaneous items below. 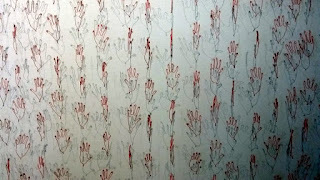 Of course, her titles for these works are more personal and political. These pics are detail views, not the works in their entirety. I also enjoyed the works of Leroi DeRubertis, maybe because I can visualize imitating them as well, although I'm not sure what form that would take. Again, these pics reflect only a portion of each installation. 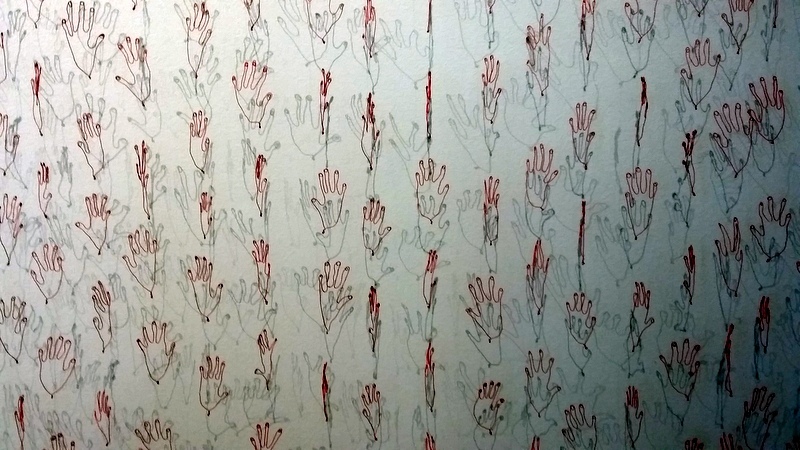 The red hands above seemed more two-dimensional, except for the shadows they cast. 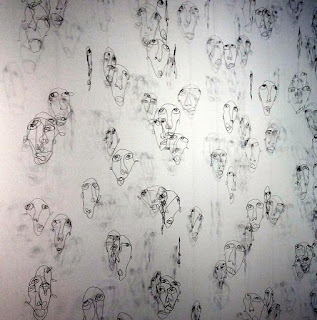 The faces below felt more three-dimensional, like viewing a crowd. Both reminded me of an exercise in high school Art 101: draw something without lifting the pencil from the page. I can be quite the homebody; it's easy for me to become glued to the couch. But getting out and about and seeing something new can be quite exciting and stimulating. It was a long day but very worthwhile. My SO spotted this weaving on the streets of Grand Rapids, MI. We were there to visit ArtPrize, their annual self-directed, multi-day, multi-venue art tour. More on ArtPrize later. Sock knitters sometimes suffer from Second Sock Syndrome. They get one sock done but somehow sock #2 never materializes. I avoid this by knitting both at the same time, more or less, alternating between the two socks until done. I haven't figured out how to do that when weaving shoelaces on an inkle loom although I'm sure there is a way. Since weaving a shoelace takes about an hour, though, it doesn't seem like such a big deal. I'm still experimenting with yarn width and technique. 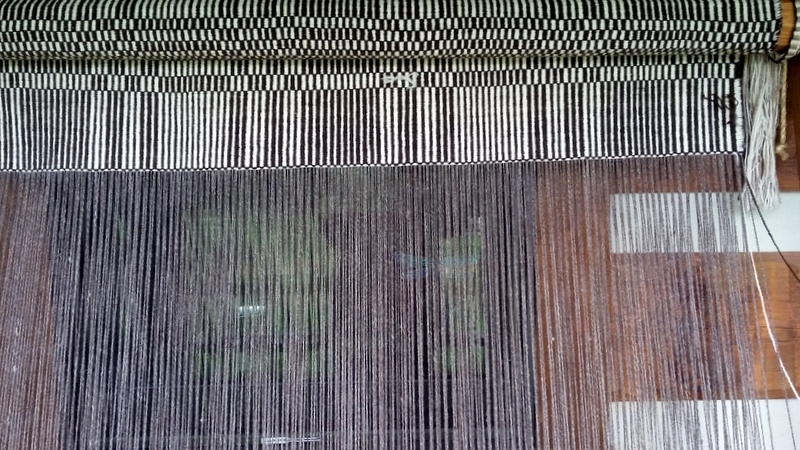 In the photo above, the lace on the left is 8/2 cotton carpet warp, knit tubular, 15 ends; the one in the middle is 8/4 cotton carpet warp, knit tubular, 15 ends; and the one on the right is 8/4 cotton carpet warp, knit flat, 15 ends. Once I wrestle the ends into aglets, I'll actually lace them into some shoes, to see what I think. Another issue is getting them the same length. I tried comparing one lace off the loom with one on the loom, but there was about a 2" difference. Not a big deal, easily corrected. Today six spools of 8/2 arrived in the mail: red, black, white, silver, orange, purple. The weaving stash groweth. Woohoo! I went to a "spin in" two Fridays ago, at my weaving pal Peggy's home in the country. There were four of us altogther, and I think I was the only one without sheep of my own. Since I was spinning roving from Butterball, one of the Salomon Farm sheep I tended two summers ago, I could at least pretend. BTW, I *love* spinning Lincoln. 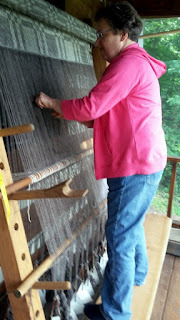 We didn't get much spinning done because we were yakking and busy admiring Peggy's devotion to all things fiber. First and foremost was the fiber studio, where we set up our wheels. It's difficult to see but there is a loom on the front porch, which I'll describe farther down. One of the tools in Peggy's fiber toolbox is an antique walking wheel. 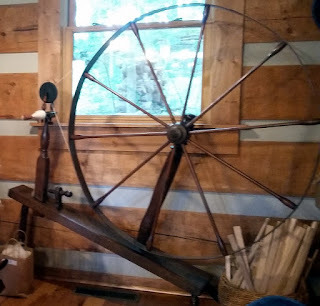 She demonstrated it for us: the yarn comes off the end of the spindle and twists as the spinner walks backwards, then the yarn is wound onto the spindle as the spinner walks forward. This model has an accelerator, to increase the ratio of turns from the wheel to the spindle. 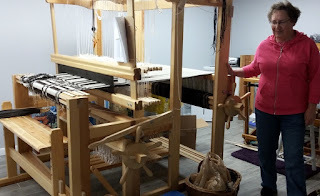 There were also looms in the cabin, big ones, and more looms in the basement (as shown here) because once one moves beyond knitting needles and crochet hooks, a single room is not enough space. Most of the looms were warped with projects in progress. Also in the basement was this large motorized drum carder. Peggy complained that even with the motor, it was not fast enough to satisfy her needs, as she has a lot of fiber to process. 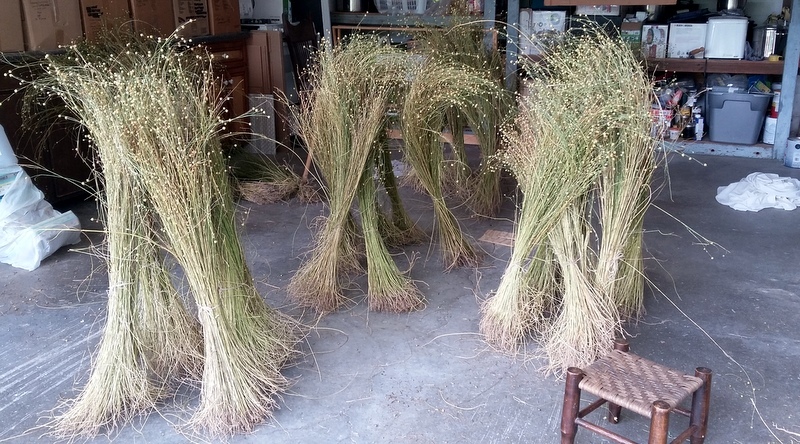 Peggy started growing flax a couple of years ago, and sheaves of it drying were drying in the immaculate garage. Flax for linen is different from flax for eating, as the former has a long stalk that encases the fiber while the latter has more branches and seeds. The stalks must be soaked (or retted, for all you crossword puzzle fans out there) to partially rot them and get access to the long fibers within. What you can't see in the photo above is the stacks of boxes that line two walls. I didn't think too much about the boxes - we all have boxes of stuff in our garages, right? - until I realized that the writing on them indicated they contained fleeces, both purchased and from Peggy's small flock. She doesn't breed her three ewes, so we referred to them as the "spinsters". 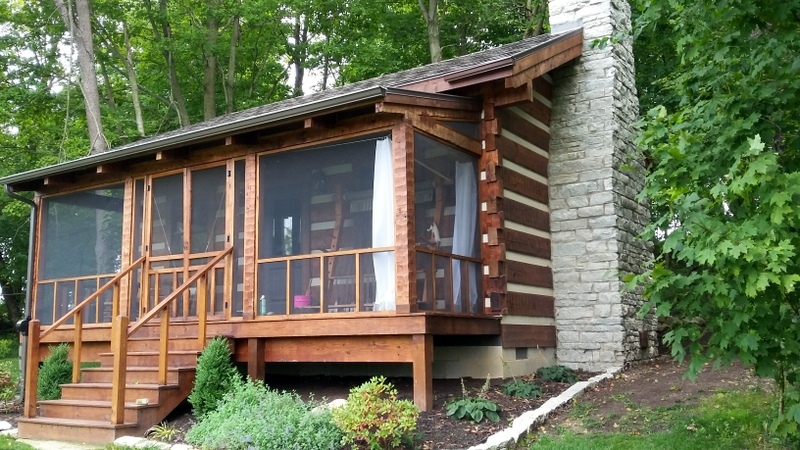 Now, about that loom on the porch. 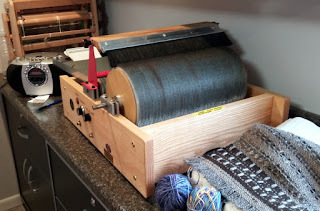 It was difficult to get decent photos of it, but if you Google "weighted Nordic loom" you will find better ones, plus videos of how to weave on them. 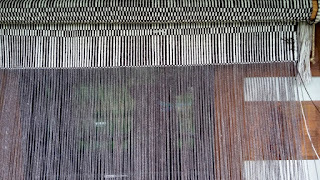 Key features are the loom is vertical, you weave away from you instead of toward you, and the warp tension is maintained by weights hanging below. Peggy first saw this type of loom while watching a special on TV, and this one was built by her handy husband. She weaves three or four wefts in a row before beating them in place with a "sword". 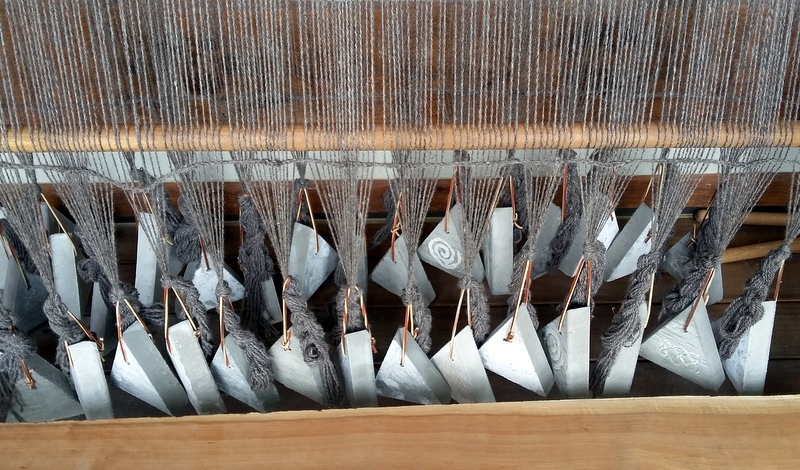 Once enough material has been woven, it is rolled onto the beam at the top. BTW, the fiber on this loom is all from Peggy's flock, handspun by her. 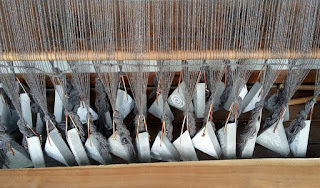 If I understood Peggy correctly, the weights were poured using the same mix one would use for a granite countertop, with a straw to provide a hole for attaching to the warp. Besides touring Peggy's fiber dreamland, the four of us talked fiber. It was probably the most fun I have had in a while, not because my life is totally boring (although some might think so) but because it is rare to have the opportunity to share with fiber-centric friends. On a side note, last Tuesday I attended a meeting of the Spinners and Flaxers Guild here in Fort Wayne. The program was a hands-on demonstration of tablet or card weaving. We didn't have time to finish our sample projects, so I'll write more about that at a later date.